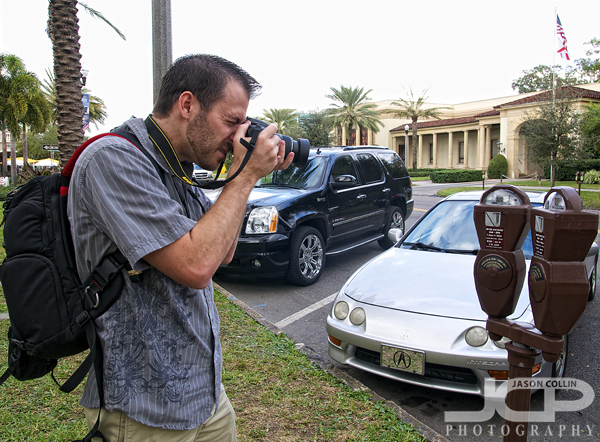 Quincy with his Nikon D5100 keeping a very close eye on his expired parking meter during our photography lessonQuincy came over the bridge from Tampa with his Nikon D5100 for a 1-on-1 DSLR Photography Lesson on a too warm to believe it is December afteroon. As he talked to me about how he currently shoots, using aperture priority mode and what I call "gaming the system" by metering off of brighter or darker objects and then recomposing to get the exposure he wants, I told him using manual mode will greatly simplify your life and avoid having to trick the camera into doing what you want! Since he did have this understanding about how exposure works though, in a rough sense, teaching him my 5-step manual mode shooting process organized what he already knew and eliminated things he no longer needed to worry about. Thus, as we walked around the downtown St. Petersburg area I answered his many questions and explained to him why such and such settings would not be logical to use and explained that certain parameters dictate when to change certain settings, like there is not really any reason (in 90% of shooting situations) to increase ISO until the limits of aperture and shutter speed are hit first. With a few key pieces of knowledge like that, one can more easily shoot in manual mode and get consistent results in any given shooting conditions.